This page contains various solutions to my APL Quizzes, send by various APL developers and one J developer!. The C# and Excel solutions are at the bottom of the page! Thank you all to have sent me your solutions to these little APL Quizzes! To be able to compare them more easily, I have taken the liberty to rename the result to r and the argument to a, as well as to rename local variables to single letter variables. This also makes the solutions more concise. to your Display functions when they did not solve the horizontal alignment of the North and South hands, to be fair with those who solved that alignment problem. ⍝ No surprise: it's not APL! ⍝ It's written in J! ⍝ first 3 quizzes at once! ⍝ but speed is kind of beside the point. ⍝ is a very common technique in APL. ⍝ and EvalSykes3 work in either origin. ⍝ whatever the argument is! ⍝ hand to the North position. Compare with my Solutions in C#! These solutions have been developed inside LINQPad v5.10 (www.linqpad.net). LINQPad provides us with the closest thing for C# to what an APL Session is for APL: it allows us to test C# expressions and display their result very visually. As you can see C# is much more verbose than APL to solve a given problem, but however the first 2 problems (Dist and SortDist) could be solved in a single C# expression. If some C# developers read this page, and decide to challenge themselves at solving my APL Quizzes in C#, I'd be very interested to see their solutions (please send to: eric@lescasse.com), because I think that there are ways to much improve my solutions to Quiz3 and Quiz4 (the Split and Display methods). The Dump method is a LINQPad method to nicely display results in the LINQPad "Session"
The pips (or suits) are not represented by SHDC but by the Unicode symbols for Spades (\u2660), Hearts (\u2665), Diamonds (\u2666) and Clubs (\u2663). See an Excel solution developed by Jacky Simon! 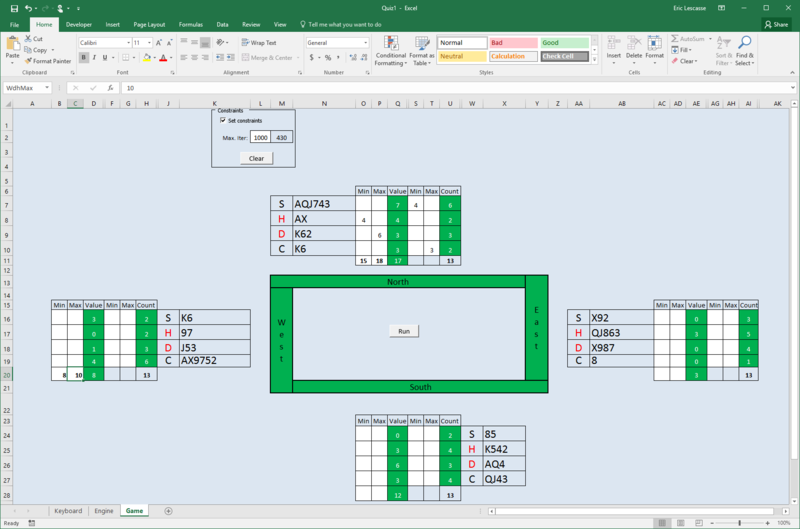 You can download an Excel workbook (Quiz.xltm (54K) containing an Excel solution to the APL Quizzes. In fact, this workbook does much more: it can compute the 4 Bridge hands under constraints! The following image shows the Quiz.xltm Game sheet with hard to achieve constraints and a solution found after 430 iterations (done in less than a couple of seconds though! ).